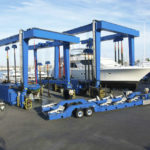 100 ton travel lift for sale provides great power for boat handling in shipyard, dockside, yacht club and marine. It is capable of hauling the boat up to 100 tons. The 100 ton travel lift can be customized to be any size and configuration in order to meet precise specifications of clients. Typically the travel lifts produced by our factory are effective at lifting and moving heavy vessels ranging from 10 tons to 1200 tons. In regards to the size of ships, wharf conditions and safe precautions, we will find a solution that works well with your goals. It can lift and transport various boats in and out of the water. 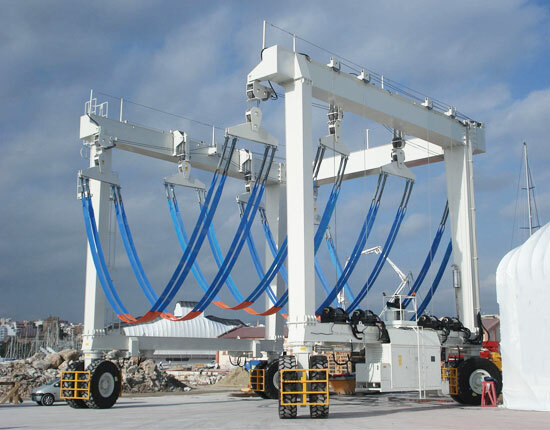 It can be utilized for the launching of a newly built ship. 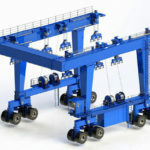 It can move and transport vessels within the dock yard and arrange them in a row in order to maximize the utilization of yard space. It can be employed for the boat maintenance and repairing work. 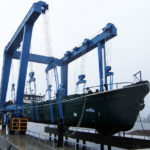 It can be used to move the hull quickly and conveniently in the shipyard. The 100 ton travel lift for sale can handle a variety of vessels, including yachts, sailboats, powerboats, fishing boats and patrol boats. 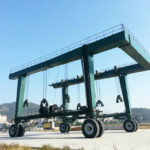 The 100 ton travel lift for sale is available in multiple types for your choice. It can be classified into hydraulic boat hoist and electric boat lift according to power source, small boat lift and large boat lift according to the boat size, remote control boat travel lift and cabin control boat hoist according to the control system, wooden boat lift, yacht lift and industrial mobile hoist according to the working occasions. Each type is specifically designed for high-level efficiency and excellent safety of dock operations. 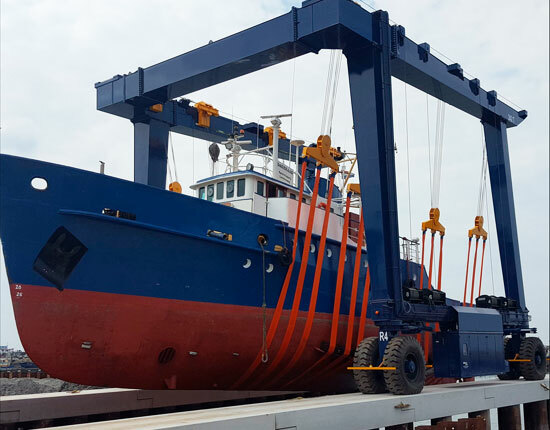 In addition, the innovative 100 ton boat travel lift has long working life, smooth movement and reasonable cost, which is an ideal and economical option for customers. To know more details, contact the sales manager online or send us an email. Working environments: shipyard, water recreation center, harbor, dockside, navy and so on. 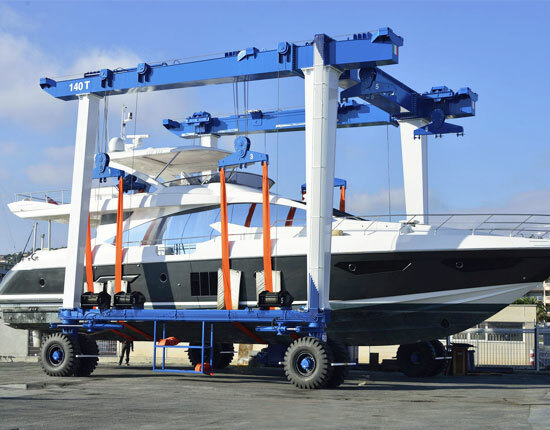 Whatever your requirements for travel lift, we will find a solution that provi des appropriate functions for boat handling. Our 100 ton travel lift for sale is available in custom height and width designs to meet your special needs. 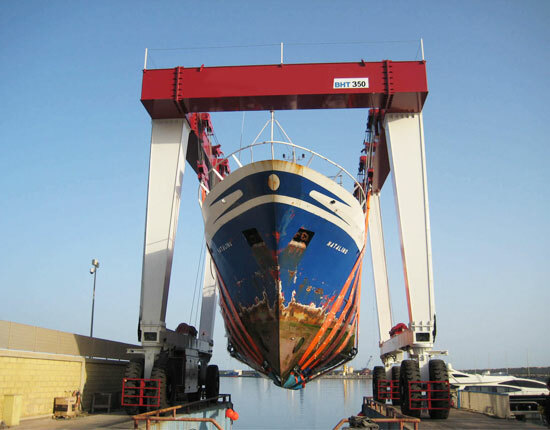 Basically, the 100 ton travel lift at marina performs several main functions, including lift-in, lift-out and transportation of vessels. 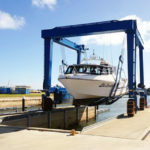 These lifting operations more or less carry the risk to people and their vessels, so learning how to use the boat lift and how to ensure safety is essential. How to operate the 100 ton travel lift? The travel lift is usually operated from the ground or by a professional driver sitting in the cabin. Each way of operation has its own pros and cons. The remote control features low cost and simple operation, making it an economical solution for light duty lifting operation. Whereas cabin control has a higher requirement for travel lift operator and it is perfect for large tonnage vessels handling. To remain a clear view and ensure a secure operation, at least two staff are required for lifting operations, the travel lift operator and a coordinator. The operator uses the controls of travellift to implement the operations of raising, lowering and traversing the lift between the storage areas. 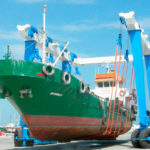 In regards to the lift-in and lift-out operations, if no more vessels need to be handled, the travel-lift should be parked aside to allow for water drainage. The personnel in lifting area should be restricted to those who are responsible for lifting operations. When the travellift is running, the operator should never leave the controls. The vessels over 100 tons should never be lifted. 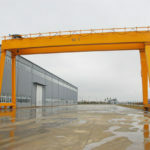 In severe circumstances such as strong winds, no lifting operations should be performed. The travel lift slings should never be pulled or dragged. We will be responsible for the inspection and maintenance of 100 ton travel lift for sale according to the relevant agreement we sign. If you have any question, please feel free to contact us. Ellsen is a seasoned travel lift manufacturer and supplier, and provides a range of lifting equipment encompassing overhead crane, gantry crane, jib crane, hoist and winch for every application and possibility of lifting. We focus on every aspect of crane design and manufacturing to make sure the products have high performance and superior quality. We also offer installation, maintenance and training services if necessary. Therefore, you can buy with assurance. To get an affordable and suitable solution, call us now!